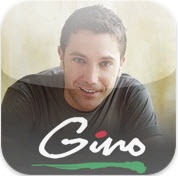 Gino D’Acampo, Italian chef and TV personality, has launched Eating Italian an app available for the iPhone and iPod touch. Created in collaboration with digital licensing company dot.Talent – they work with celebrity talent to acquire rights, create content, and publish in formats across Mobile, Web and Social Media – and launched to coincide with his new book, Gino’s Pasta, the App will contain modern Italian recipes, cooking tips, a pasta glossary and more. Featuring specially created content and shot in HD, Eating Italian also offers Gino’s top creative tips and steps to preparing delicious food for the senses, whilst the glossary is designed as an aid to pronouncing those names of sometimes difficult Italian pasta dishes. Designed for any cooking enthusiast wanting to experience the colours, smells, flavours and creativity of their favourite Italian chefs’ kitchen. Recipes include Italian classics such as Melanzane alla Parmigiana and Tiramisu and Gino’s favourites such as Pollo al Marsala and Tonno con Gremolata and 3 Minute Dishes such as Gamberoni Menta e Limone and Caprese Salad.